When it comes to the web server and file hosting world, where computers run 24/7, power consumption is often the leading concern when selecting hardware. The same is often true for low-load applications, such as HTPCs, where power and heat are at odds with a silent, inexpensive machine. For these machines, which might see an occasional spike in load but typically sit in a near-idle state, a low idle power consumption is key. The place where lower power components are not as valuable is the high performance computing world. Here, the goal shouldn’t be isn’t the absolute lowest power consumed, but the lowest power required to do a unit of work. Flipping this around, the goal is to maximize the amount of computational work done per unit of power. This is computational efficiency. In this article, I’m going in the other direction. I’ll be testing a little teeny-weenie computer, to see just how well an ultra-low power consumption computer does in terms of computational efficiency. Four years ago, AMD did something that some people thought was silly. They released a socketed version of one of their ultra low-power processors. This meant that instead of being constrained with a tiny integrated device like chromebook, people could actually build an upgradable desktop with a drop-in CPU. Well, APU, actually, since AMD included the graphics on the chip. I won’t go into too much detail, other than to point out that the flagship chip, the Athlon 5370, was a quad-core, 2.2 Ghz APU with 128 Radeon graphics cores, and an amazing Thermal Design Power of just 25 watts! In a time when the most energy efficient dual and quad-core processors were hovering around 45-65 Watt TDP, this chip was surprising. And, it eliminated the need for a discrete graphics card. And all for $60 bucks! So, I got my hands on one (not the 5370, but the slightly slower 2.05 Ghz 5350). The prices are a bit inflated now (some nutters want up to 300 dollars for these little guys on eBay, although if you are lucky you can get a deal). 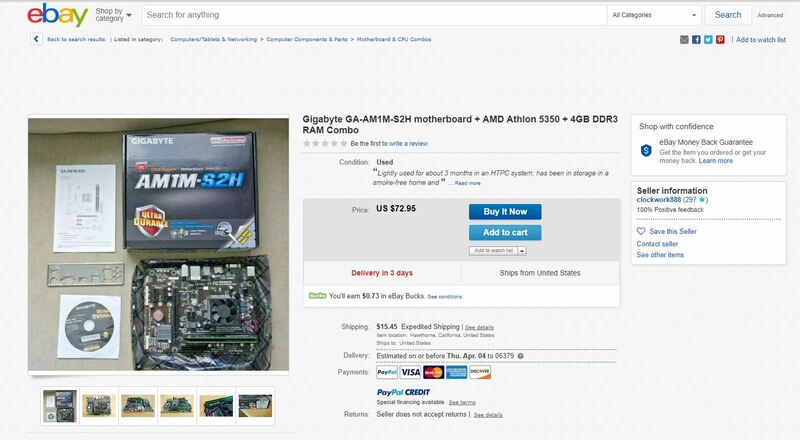 For example, this isn’t the one I bought, but it’s a pretty nice combo (board, ram, and CPU) for $72 dollars. AMD 25 Watt Quad Core Deal! Since the goal was to make a machine with the absolute lowest system power consumption, I got a Gigabyte GA-AM1M-S2H microATX board and two sticks of DDR3L (1.35 volt) energy efficient memory. The hard drive is an old, slow, single-platter (I think) Hitachi 80 GB unit, which seems to offer passable performance without the same power consumption as larger multi-platter drives. I used a Seasonic Focus 80+ Platinum 550 watt power supply, which is one of the most energy efficient PSUs available (I went with this vs. a Pico PSU because I wanted the ability to add a big graphics card later). I put 4 80mm case fans on a controller so I can take them right out of the equation. Here’s pictures of the build. All the stickers make it faster…and external case fans are the bomb (put them on there for my kids to play with). After a bit of fussing around, I was able to get the machine up and running with Linux Mint 19.1. Using my P3 Kill A Watt Meter, I measured a system idle power consumption of about 23 watts with the case fans off and 28 watts with the case fans on. That’s less than half of an incandescent light bulb! As you can see, the machine is not fast enough to always return a work unit every day. However, using a 10-day average, the Points Per Day production is 1991.4 PPD. This is in the ballpark of what was reported by the client. Power consumption when folding was 35 watts (30 with case fans off…with a system this small, the fan power consumption is a significant percentage). I thought it would have been a bit higher, but then again, power supplies are not very efficient at super low loads, and this machine’s mid 20-watt idle consumption is way, way less than what the Seasonic 550-watt PSU is designed for. 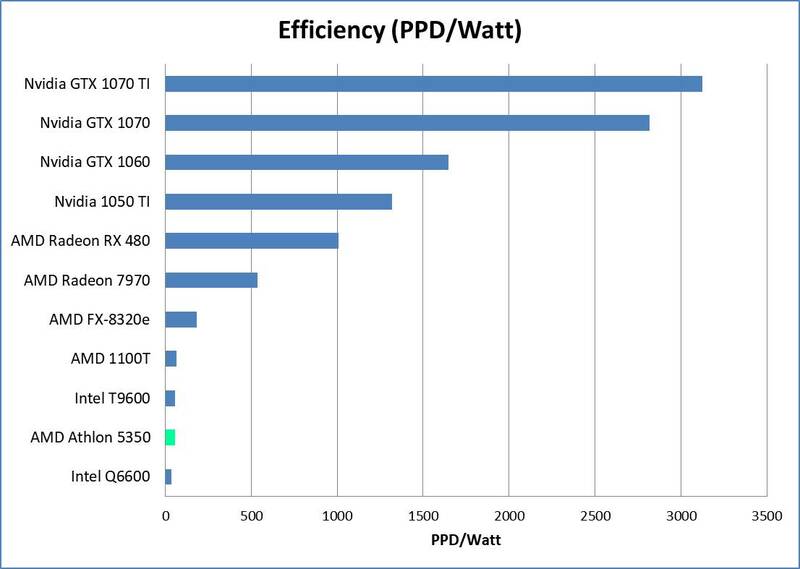 As the power consumption comes up out of the ultra-low region, the PSU efficiency increases. So, throwing a full 25 Watt TDP of CPU folding at the equation resulted in only a net 10 watt increase in power consumption at the wall. 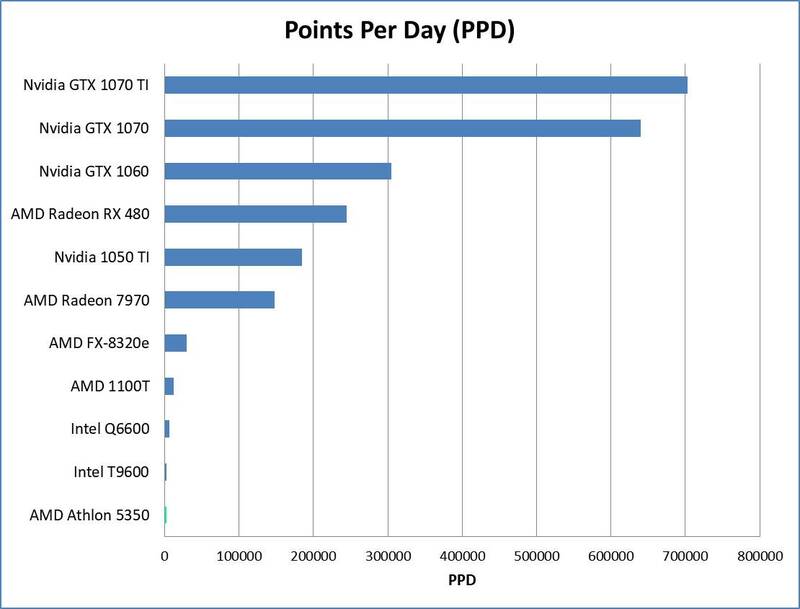 The following plots show how this stacks up to other hardware configurations. On the wattage plot, I noted which test machine was used. The Athlon 5350 is not very fast…all the other processors do more science per day, and the graphics cards do a lot more! The Athlon 5350 is also not very efficient. Even though its power consumption is low, it does not produce much science for the power that it draws. It is, interestingly, more efficient than an old Intel Q6600 quad core. The Athlon 5350 is an extremely low-power CPU. The desktop build here draws less power than anything I’ve tested, including my laptop! 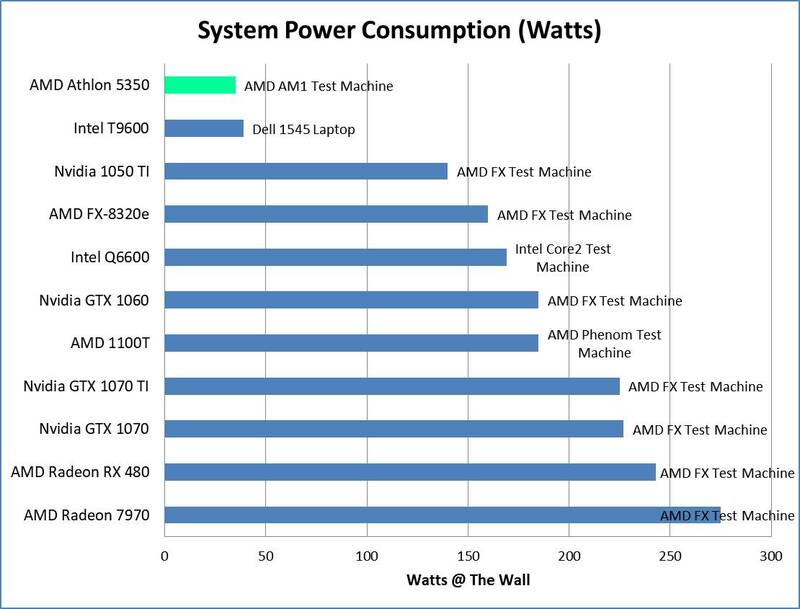 Super low-power consumption computers, such as one based on the 25-watt quad-core Athlon 5350, are good at (you guessed it) drawing almost no power from the wall. I was able to build a desktop machine that, when running full tilt, uses the same amount of power as three LED light bulbs (or half of one standard incandescent light bulb). It even uses less power than my laptop (and my laptop is tiny!). That’s pretty cool. Sadly, that’s where the coolness end. If your goal is to do tons of computation, low-power PC parts won’t help (dur!). In the case of supporting disease research for Stanford University’s Folding@Home distributed computing project, the Athlon 5350 test system got spanked by everything else I’ve tested, including my 10-year-old Inspiron 1545 laptop. Worse, despite its ultra low power consumption, the sheer lack of performance kills the efficiency of this machine. As a side note, I have been overwhelmingly pleased with the computer as a HTPC. It is quiet, uses almost no electricity, and is actually pretty quick at multi-tasking in Linux Mint’s desktop environment, thanks to the 4 CPU cores. This build also offers me the chance to test something else…namely pushing the efficiency of graphics card folding. By reducing the background system power consumption to an incredibly low level, the whole-system efficiency of a folding computer can be increased. 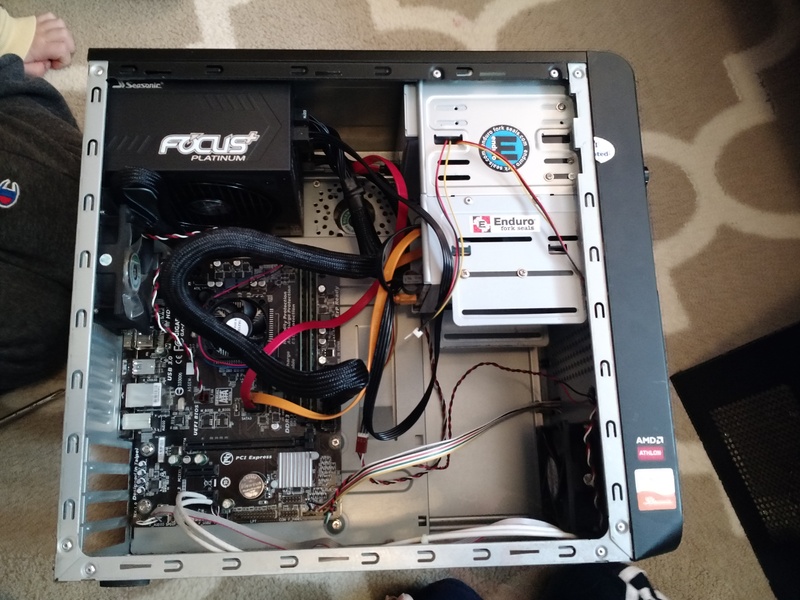 All I have to do next is give this little computer some teeth…in the form of a big graphics card! So, it sounds like I’ll have to do another article….stay tuned!